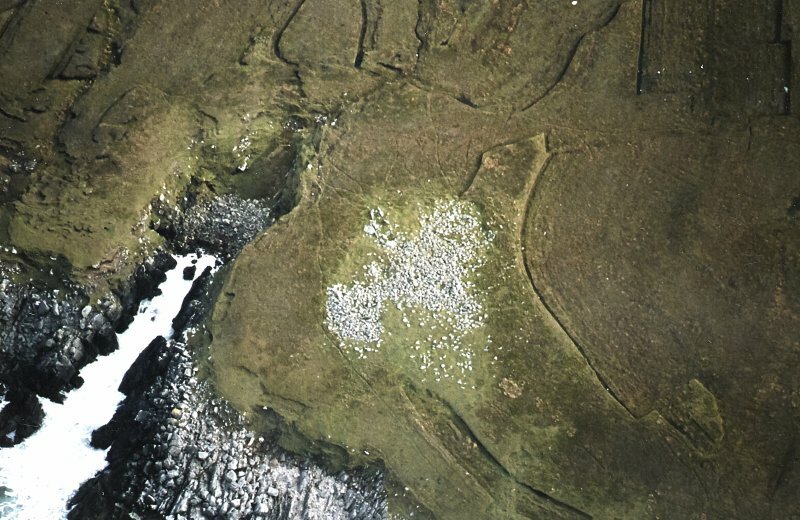 Oblique aerial view centred on the remains of the chambered cairn, taken from the WSW. 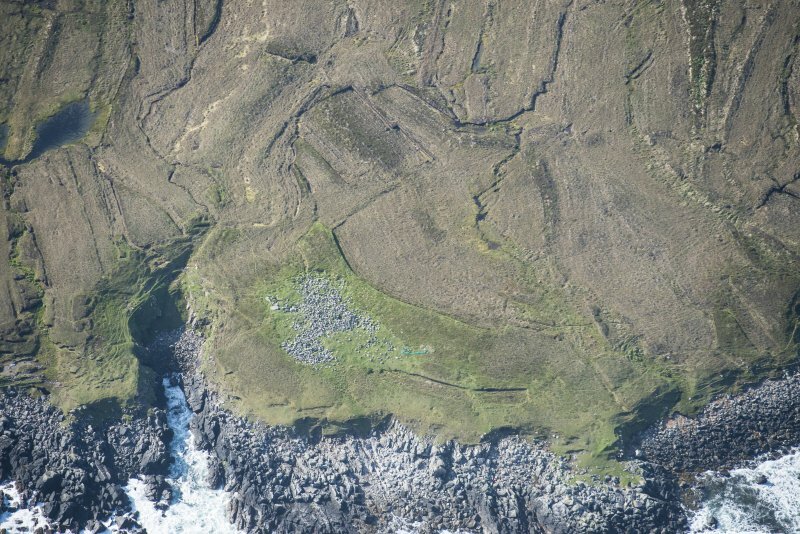 Oblique aerial view centred on the remains of the chambered cairn, taken from the WNW. General view of Caisteal Mhic Creacail chambered cairn, taken from the east south east. 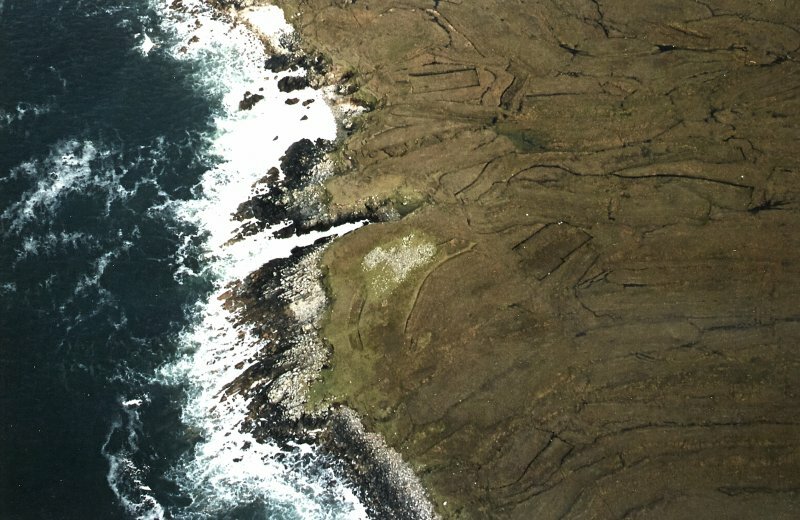 Oblique aerial view centred on the remains of the chambered cairn, taken from the SW.
Oblique aerial view centred on the remains of the chambered cairn, taken from the SSW. 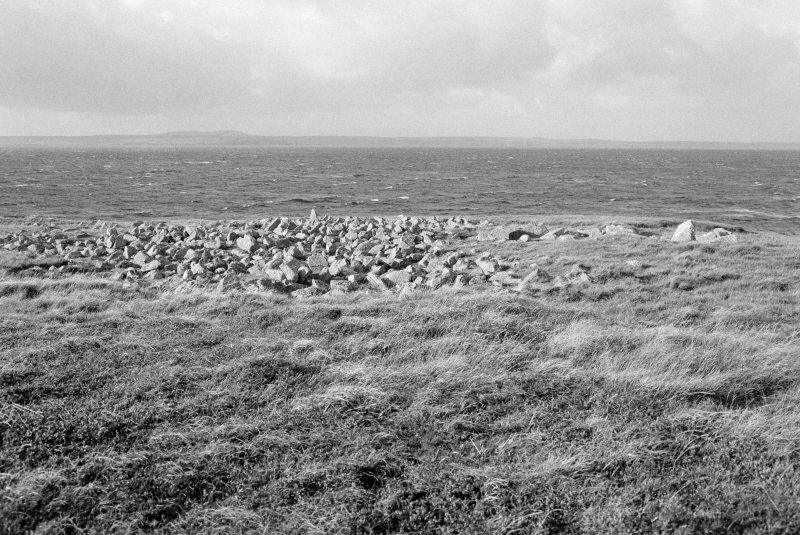 View of cairn from WNW. View of chamber and passage from ESE. 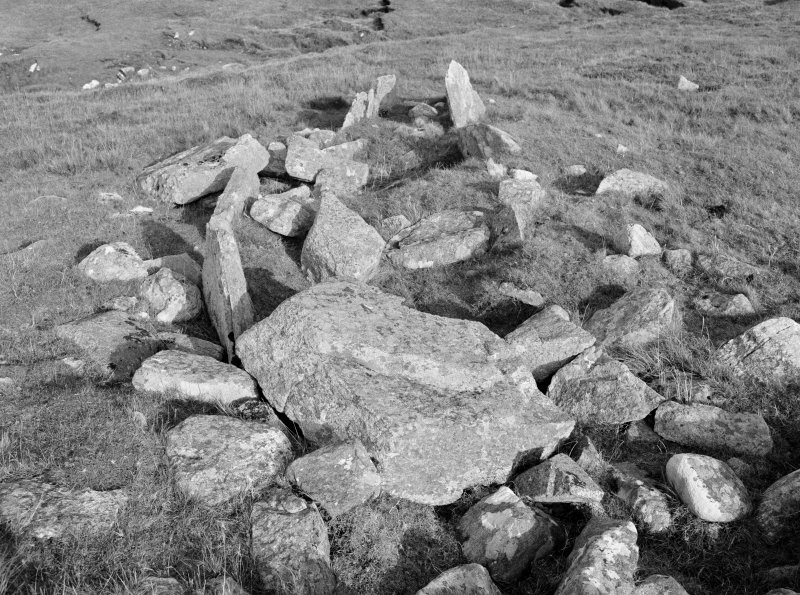 Detail of collapsed cairn of Caisteal Mhic Creacail chambered cairn. 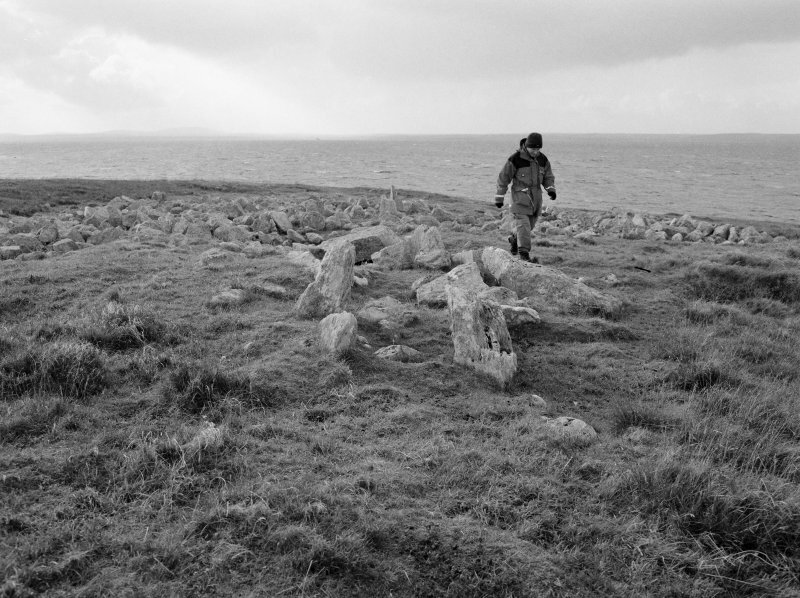 General view of Caisteal Mhic Creacail chambered cairn, taken from the south south west. 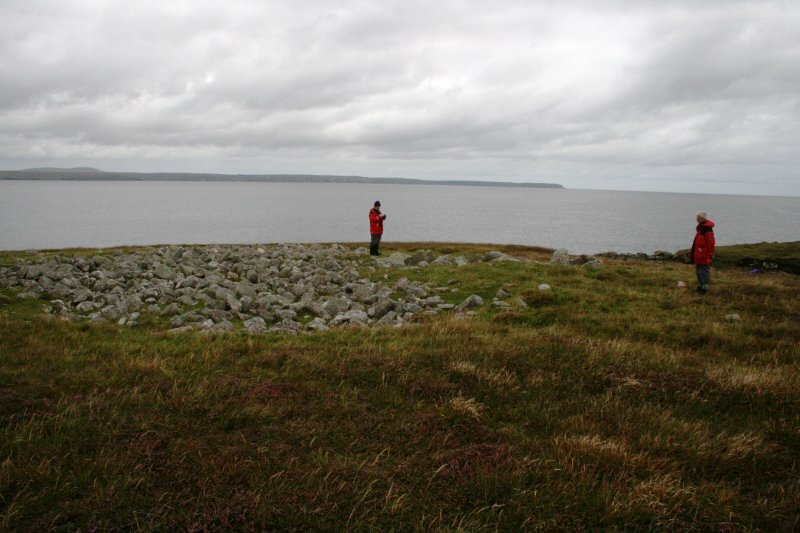 View of cairn from SSW. 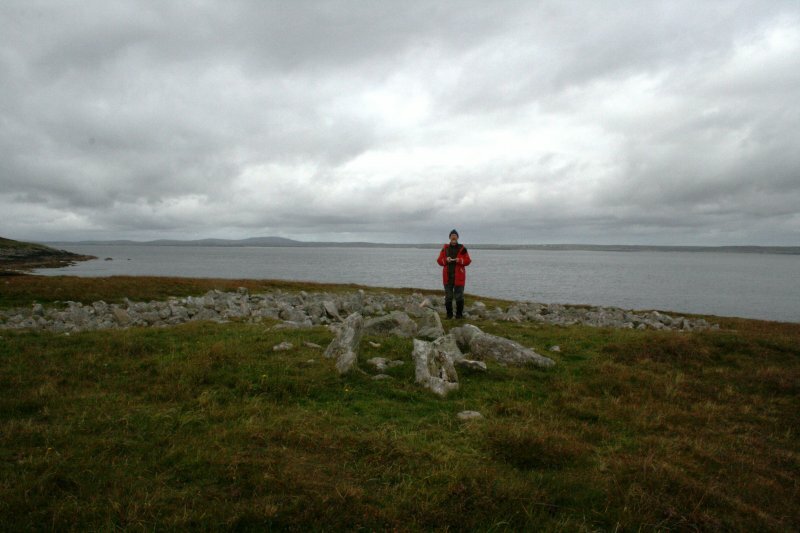 View of cairn and chamber from ESE. 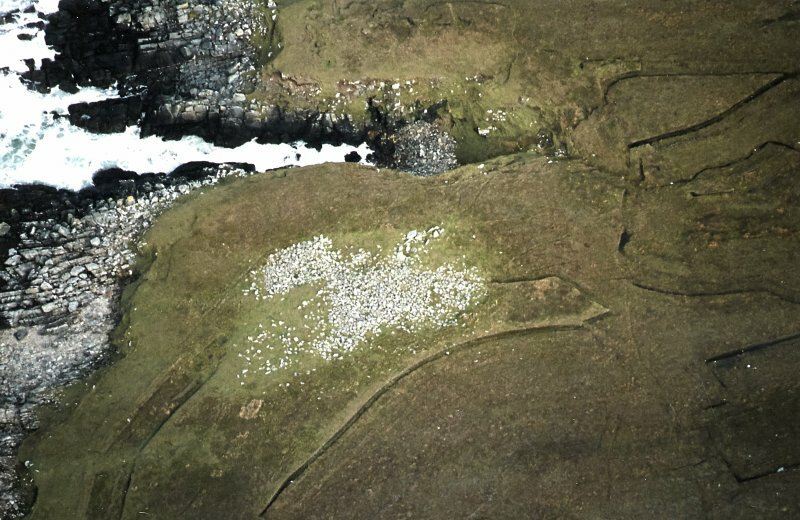 'An irregular heap of stones known as Caisteal Mhic Creacail. 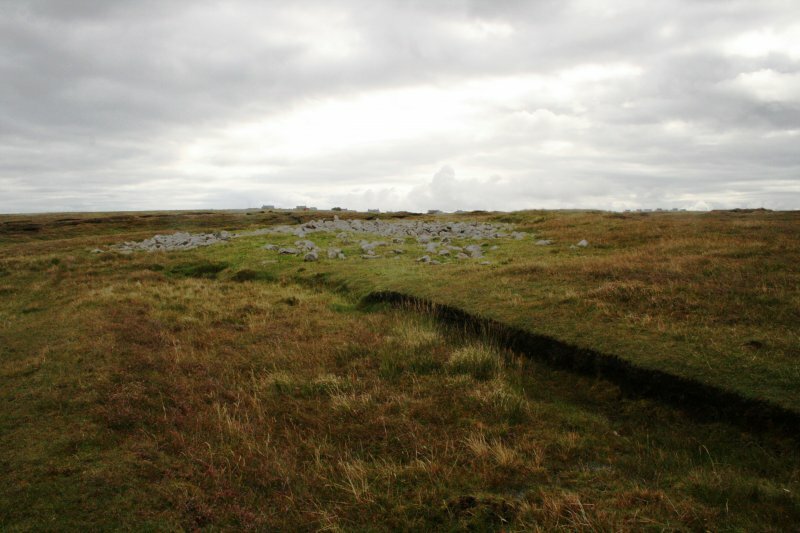 The remains show none of the characteristics of a ruined dun...but a setting of seven large slabs placed on edge, and two prostrate stones towards the SE edge of the heap , though evidently much disturbed, have the appearance of the ruined passage and chamber of a chambered cairn. 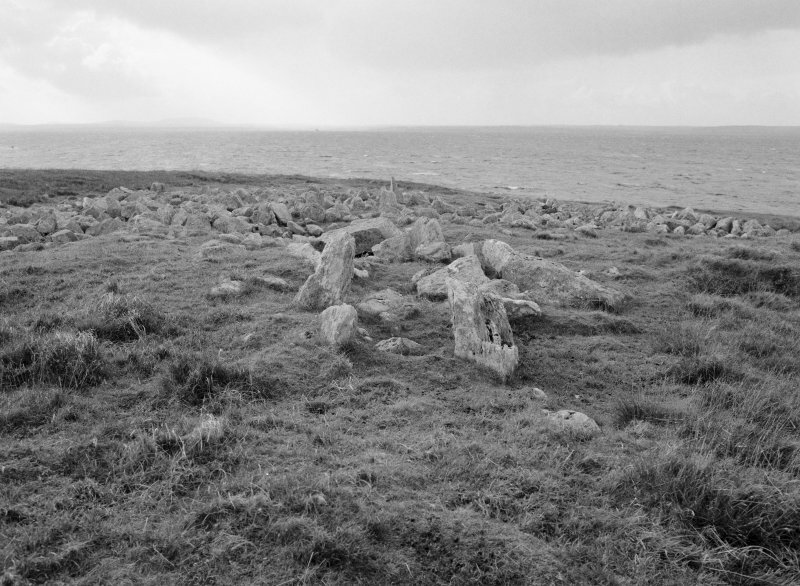 Four erect slabs from 1ft 7ins to 4ft 6ins in length and a fallen stone form the northern side of the entrance and curved chamber, while three stones placed on edge from 2ft to 4ft 1ins in length mark the opposite side. The loose stones of the mound have been entirely removed from the eastern part of the structure, but stretching for 70ft towards the WNW from the erect slabs is a tumbled mass of small boulders, and 40ft to the N the ground has a covering of stone 30ft long by 15ft broad'. 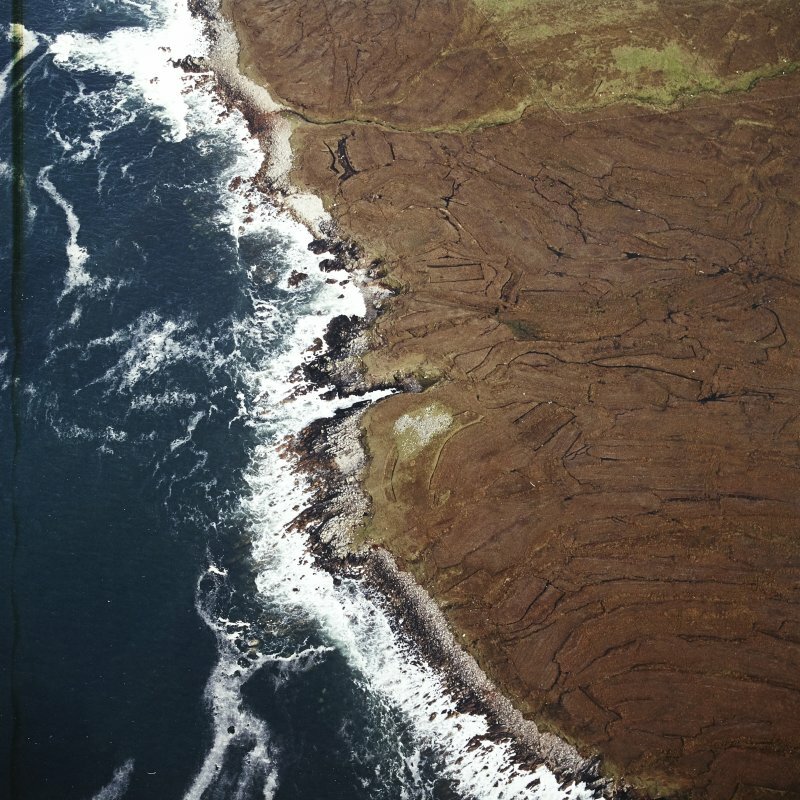 As described by RCAHMS. The entrance passage 2ft to 2ft 6ins wide and 8ft long and the curve of the chamber beyond, are still visible. Visited by OS (A L F R) Assistent Archaeology Officer, 23 April 1964. 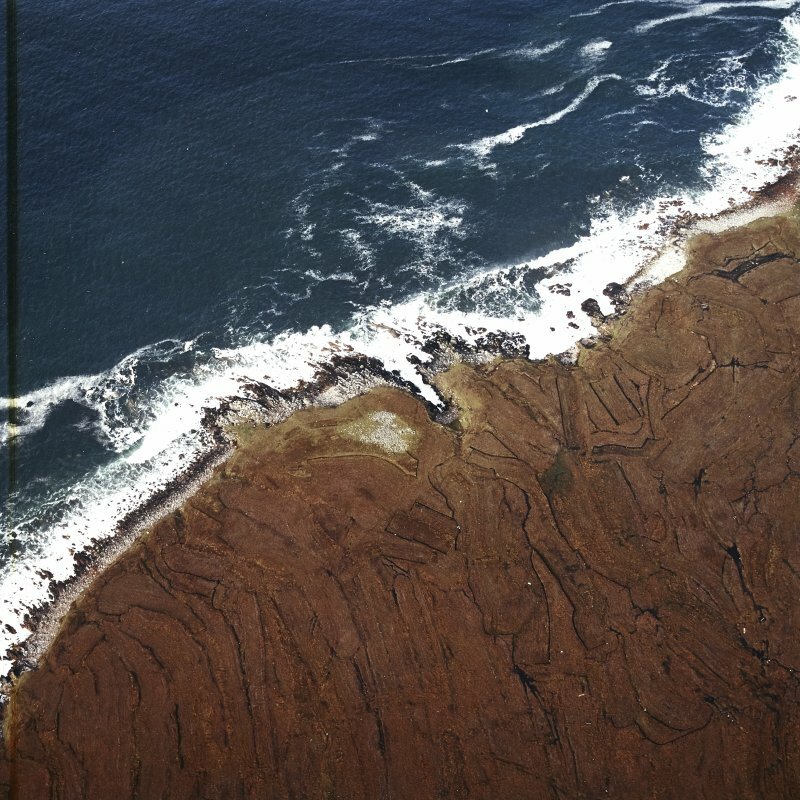 This cairn lies in peat moorland above the rocky foreshore on the W side of a narrow inlet. 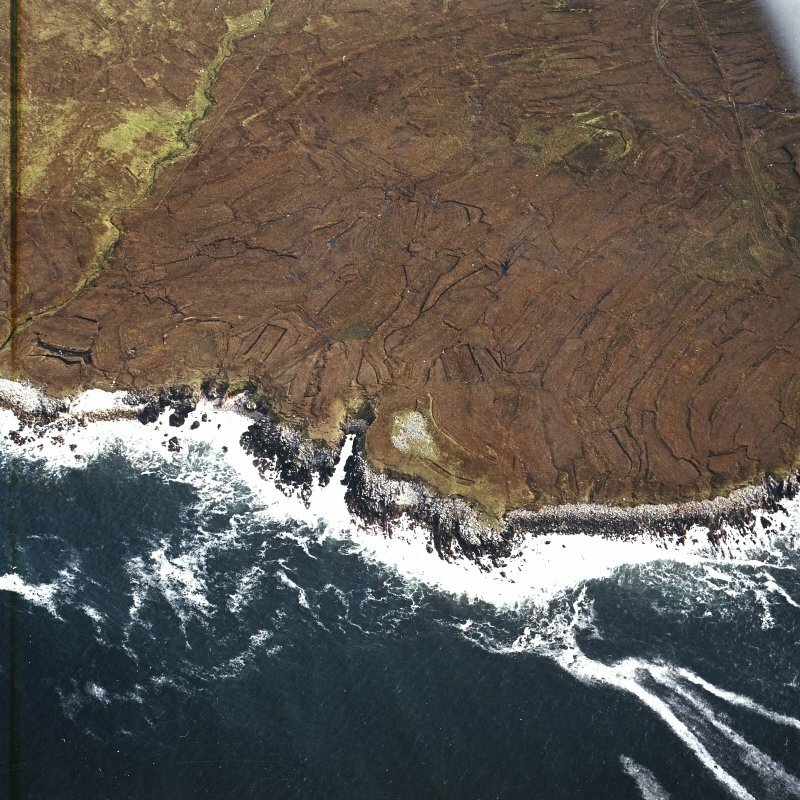 Peat surrounds the cairn and has now grown to such a height on the S that it gives the misleading impression that the cairn lies in a hollow. 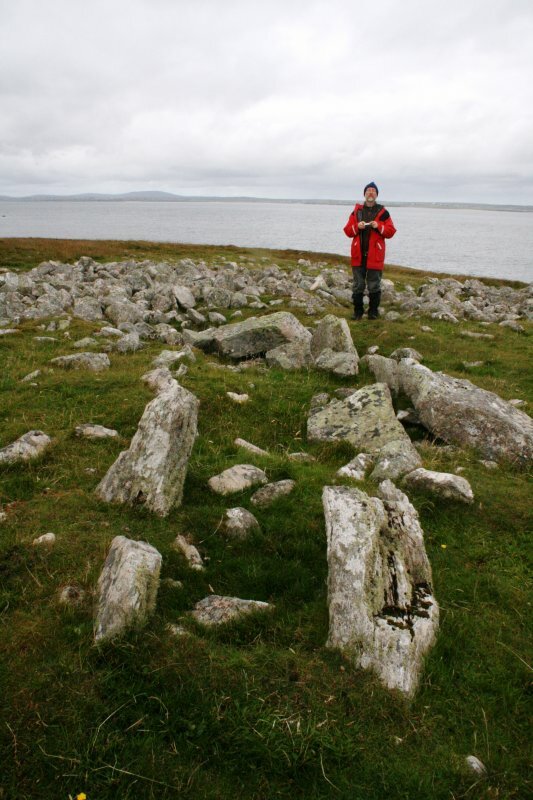 The cairn appears to have been heavily robbed to expose the stones of the chamber, though given its isolated location it is difficult to see where the stone would have been reused. 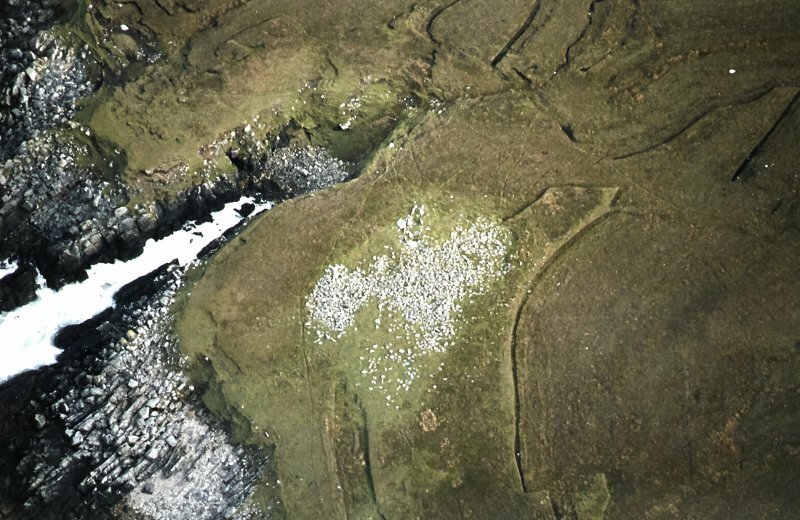 The chamber is entered from a passage on the ESE but is not symmetrical to the cairn as it survives today. 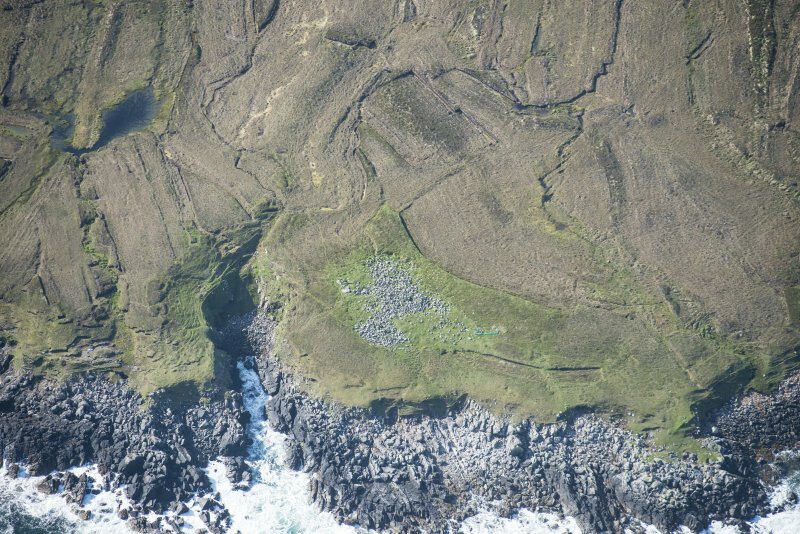 A small subrectangular pen has been dug into the cairn material on the W.